Miniature File Cabinet with Clock PI-9617 [Mini File Cabinet w Clock PI-961] - $24.95 : NewDaVincis.com!, Great Innovative Products, Gadgets and more. 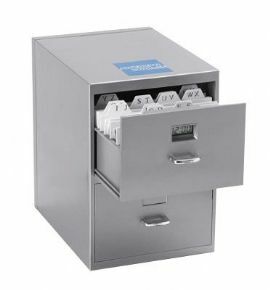 This miniature file cabinet provides perfect storage for over 700 business cards. Made of sturdy plastic, it playfully mimics the real thing. Top drawer has built in digital clock with date. A-Z card index included. Fun and efficient for office or home! Comes in Metallic Silver. 4 1/4" W x 6" H. Corporate logo imprint area: 1 1/2" x 1/2". Please note: Brand Logo is for reference only.